it's crunch time: the deliciously confusing world of toffee...or is that buttercrunch? Toffee or buttercrunch, this type of candy comprises the aforementioned sugar and butter, sometimes with a little water added. It is cooked to the hard crack stage (as high as 300 degrees F on a candy thermometer). During cooking, the sugar caramelizes, which accounts for the rich brown hue of good toffee, as well as the buttery, caramel-like flavor. As with most boiled sugar candies, care is required during the manufacturing process. Given the high temperature to which toffee or buttercrunch is cooked, it can scorch or burn. The sugar in either candy needs to dissolve completely during the cooking process, or crystallization can occur and the candy's texture will be gritty. Once the candy is finished cooking, nuts may be stirred in (sometimes, vanilla or other flavorings are added, as well). The toffee is then poured out, usually onto a baking sheet, into a thin layer. 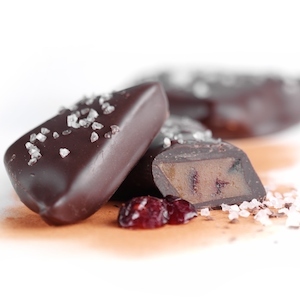 It's common for chopped chocolate to be placed atop the buttercrunch when it has cooled somewhat but not completely. In this way, the heat of the boiled mixture melts the chocolate, which can be spread on the top surface easily and then finished with chopped nuts, if desired. Alternatively, the buttercrunch cools completely before melted chocolate is spread atop it; the candy is then finished with nuts sprinkled on the chocolate before it sets. Where a chocolate covering is desired on both sides, I've seen recipes that call for placing chopped nuts and chopped chocolate onto a baking sheet before the boiled mixture is poured onto the sheet, but I would never do that. First of all, you're pouring a boiling-hot mixture onto chocolate, an ingredient notorious for sensitivity to heat, so I think there's a good possibility of scorching the chocolate. Also, I find it likely that this method would cause an uneven (at best!) distribution of chocolate and nuts on one side of your buttercrunch. My method is more work than most, but I think it's worth it. Make the boiled mixture, add nuts/flavorings, pour it out, and let it cool completely. Break it into serving-size pieces. Dip each piece into melted chocolate, then dip into finely chopped, toasted, cooled nuts. This method gives you much more of a chocolate presence than most buttercrunches have, you don't scorch your chocolate, and the finished buttercrunch is absolutely beautiful. As sweets go, toffee is not ancient. Most food historians agree that it first became popular in the early 1800's, particularly in the UK/Northern Europe, where butter was plentiful. Several sources indicate that cheap slave labor in the Caribbean (and elsewhere) in the early 19th century drove down the price of both sugar and molasses, particularly treacle (a golden syrup made with molasses and often used in baking and candy making in the UK); both sugar and treacle can be used to make true English toffee. The Oxford English Dictionary first mentions “toffee” in 1825, implying that the word had already been in use for some time. At some point, toffee made its way across the pond, although I haven't been able to find any reliable information on when this might have occurred. One of the most popular brands of buttercrunch in the US, Almond Roca, was introduced in Tacoma, WA in 1923 by Brown & Haley. At that time, most candy making was local, so it's difficult to know how much competition existed (there was no national distribution or nation-wide shipping, so most candy makers didn't feel the need to advertise out of their immediate area, if they bothered to advertise at all). Times have really changed! Now, it seems as if every third person in the US is making buttercrunch, although it's usually still called toffee or English toffee. Why the incorrect name? TheNibble.com speculates that the manufacturers don't understand the difference between the two products, or perhaps they believe that a confection called “English toffee” will sell better. I believe it also has to do with sound and brevity. “Toffee” is a much shorter word, and it's easier to incorporate into a catchy name. No matter what it's called, buttercrunch is available in almost as many varieties as there are manufacturers. I believe almonds remain the most frequently used type of nut, but you can also find buttercrunch made with pecans, walnuts, pistachios, macadamias, and hazelnuts. 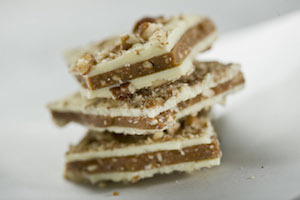 Buttercrunch is offered in small “logs”, individual-serving-size squares, or larger pieces you break to size. Manufacturers still use plenty of milk chocolate, but dark chocolate is growing in popularity, and a few use white chocolate for some of their flavors, as well. Speaking of that, it's a long way from the days when there was one flavor of buttercrunch. A brief search online will show you just how creative buttercrunch makers can be. Texas Toffee Queen (www.texastoffeequeen.com) has a Dark Chocolate Salted Blood Orange and a White Chocolate Mango Chili. If you have ever pondered the concept of alcohol in toffee (and I'll be honest; the idea had never occurred to me), Goodytwos Toffee Company (www.goodytwos.com) has beaten you to the proverbial punch, with their Creme de la Crunch (coffee liqueur) and tequila-infused Nutty Twist. Oregon's Holm Made Toffee Co. (www.holmmadetoffee.com) produces a hazelnut toffee with lavender and another with red pepper flakes. Asian Accent (with ginger and wasabi peas) and Chai-cago Spice (cinnamon, cloves, nutmeg, ginger, cardamom, and pepper) are two of the more unusual flavors offered by Terry's Toffee (www.terrystoffee.com). For those who'd rather stick to more conventional flavor combinations, but still enjoy something a bit different, Cold Mountain Toffee (www.coldmountaintoffee.com) makes a Cafe Mocha with Almonds and a Peanut Butter variety. And Toffee Break (www.toffeebreakdesserts.com) offers a Mocha Latte Toffee, a Raspberry Toffee, and a Streusel Toffee. And yes, all of these businesses make buttercrunch, but they refer to their products as toffee. With so many brands and so many varieties, how will you know a good buttercrunch when you come across it? Some buttercrunches are quite thin, while others are several times as thick. Their textures can range from quite hard and crunchy to much softer and chewy. As mentioned earlier, chocolate can be on one side or both, and it can be dark, milk, or white. The type of nut used can differ significantly. How do you judge? Much of that has to do with your personal preferences, but there are a modest number of standards. Good buttercrunch should have an appealing look and aroma. It should not taste burned or scorched (I tried a handful of different buttercrunches for this article, and one of them did indeed taste slightly burned). Despite its buttery quality, good toffee should not be greasy. It shouldn't be too hard to bite into (this can be an issue with very thick toffee, as well). It shouldn't be gritty. While less perishable than something like a fresh-cream truffle, buttercrunch doesn't last indefinitely. The nuts used, either in the toffee itself or as a coating on the chocolate, should taste fresh. And the chocolate itself should be of decent quality. Beyond that, it's about what you like. Given the great number of buttercrunch manufacturers and the even larger number of varieties, I hope you'll take the opportunity to sample some different products and find something you truly enjoy. Try buttercrunch at a local Farmers' Market, buy some in your travels, or order it online; you'll find something for every taste imaginable. Below you'll find a recipe I really like for buttercrunch (yes, it's called toffee). I modify this recipe by making the toffee portion without the chocolate, allowing it to cool completely, breaking the sheet into individual serving pieces, then covering each in chocolate and finely chopped, toasted nuts. If that sounds too much like work, simply use the chocolate as described in the recipe. A candy thermometer is a must! There is no recipe in this book that caused as much frustration and as much revision as this one: I don’t even want to describe how sizeable and how icky my failures were. In fact, until I found this recipe, a slight variation of Helen Witty’s (from The Good Stuff Cookbook), I had despaired of including a recipe for toffee. And yet . . . really good toffee is so good that I persisted. The amount of nuts in this recipe produces a toffee the way I like it: completely immersed in nuts. If you prefer yours only dotted, simply reduce the quantity of nuts. If you want your toffee thin, be sure to finely chop the nuts. If you want it thick and bumpy, leave them either whole or coarsely chopped. 1. Line a baking sheet with parchment paper. Butter an offset spatula. 2. Place the butter in a large, heavy-bottomed saucepan (larger than you imagine you will need) and, when it is halfway melted, add the sugar, corn syrup, and vinegar. Bring to a boil over high heat and continue to cook, stirring the whole time, until it reaches the soft-crack stage and is a pale golden brown, 275 ̊ to 290 ̊F on the candy thermometer, 12 to 15 minutes. 3. Quickly stir in the nuts and pour immediately onto the prepared sheet. Using the buttered spatula, spread the toffee as thinly as possible. Let stand for 1 minute, then sprinkle with the chopped chocolate, if using. Let stand for 2 minutes to soften, then spread the chocolate with the back of a spoon or a rubber spatula until it has melted. Sprinkle evenly with the chopped nuts. (Omit them if you aren’t using the chocolate.) Set aside to cool completely, then break into large pieces. 4. Store the toffee in an airtight container, where it will keep for 2 to 3 weeks. Stephanie (HandOverTheChocolate@comcast.net) has had a strong affinity for chocolate from a very early age. Family members claim that, as a child, she was able to hear chocolate being opened in the kitchen no matter where she was in the house. Stephanie was baking by the time she was 6 and ran a short-lived baking business out of her parents’ kitchen when she was in high school. She has a Master’s Degree in Foods from Virginia Tech but no formal training in cooking or baking. Consequently, she is a home cook, not a chef. Prior to beginning this column, she had written about chocolate for some 8 years.